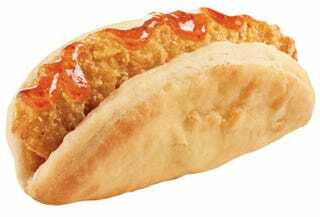 Yes, that is a taco made out of a biscuit, and yes, that is something Taco Bell is selling at select locations right now. The biscuit taco has previously been tested in San Antonio, TX (as opposed to San Antonio, ND)* and Atlanta, GA. Presumably it did well enough to justify continued product testing, and it's currently available in Orange County, CA (seriously? Orange County?) and Los Angeles, CA. Get 'em while they're still freshly** processed, I guess. While the above iteration is the chicken with jalapeño honey sauce, there are actually seven total varieties of Biscuit Tacos (way to get creative with your naming practices there, Taco Bell): Sausage, Egg and Cheese, Bacon, Egg and Cheese, Sausage and Cheese, Egg and Cheese, and Sausage and Gravy. * I am NEVER getting tired of this joke.